I hate Sloppy Joes. A lot. On a scale of one to chitterlings, they're a nine. I think because I'm not a ketchup person and traditional Sloppy Joes pack a lot of twangy ketchup flavor. Or maybe I'm just weird. But the onions love them. And they're cheap. Sloppy Joes are cheap, not the onions - the onions are very expensive. To change things up I usually just use pizza sauce, add the pizza toppings I like (black olives and mushrooms), top them with with mozzarella and call them Pizza Joes (you're welcome). Tonight, though, I had a hankering for cheesesteak and thought, meh, why not? They were really pretty awesome! Husband said they tasted just like the cheesesteaks at the mall. I'm not sure if that was a compliment or not, though. Cook ground beef and green peppers over medium-high/high heat (that place on the dial between medium-high and high) for 4-5 minutes or until about half the pink is gone. Drain the meat mixture well and add back to pan. Add salt, pepper, garlic and onions and continue cooking until peppers are tender and meat is cooked through. Set aside. Broil buns, split-side up, until toasted. Spoon cheesesteak mixture evenly onto bottom buns. Place cheese slices on top and broil until cheese is melted. Spread mayo onto top buns and place one onto each sandwich. I have just learned about your blog from a friend, and already I am hooked! Thanks for all the great ideas!!! These are great. We call these Hillbilly Philly's ;) so fast easy and tasty!! Made these tonite for supper and my family couldn't believe how much these tasted just like cheesesteaks with using hamburger, loved it!! Thanks for sharing. I took a chance and made this for my exceptionally picky eater husband. 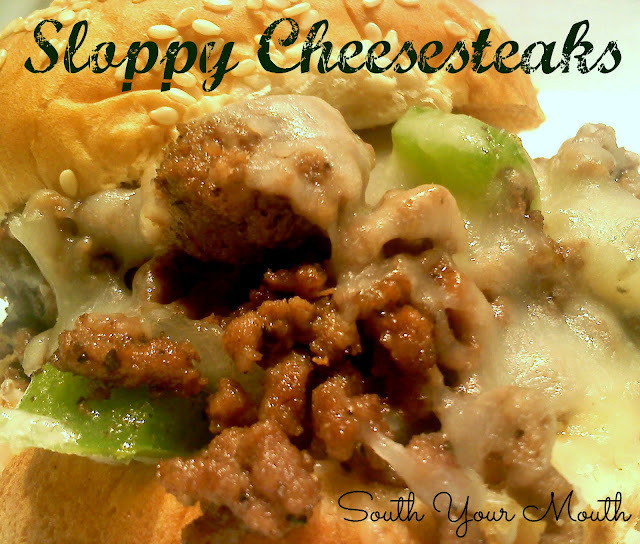 He loves traditional Cheesesteaks; however, this looks different as it's made with ground beef (rolling my eyes). The flavor was spot on. Verdict: my picky eater husband LOVED it, as in he is asking me to make it again next week!